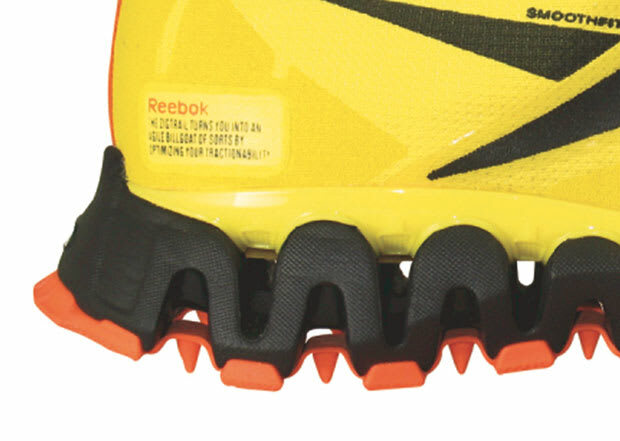 Reebok Premier ZigWild TR "Blaze Yellow"
Reebok puts their popular ZigTech cushioning/energy return system to work in a trail runner for fall, placing spikes in between the Zigs and adding a rugged reinforced one-piece nylon upper to create the Premier ZigWild TR. Six colorways are all expected to hit at once, but this Blaze Yellow/Black/Blazing Orange screamer is the one that does it for us. The little tag on the side reads "The Zigtrail Turns You Into An Agile Billygoat of Sorts By Optimizing Your Tractionability." Of course it does. Look for them to drop on July 2 for $110.